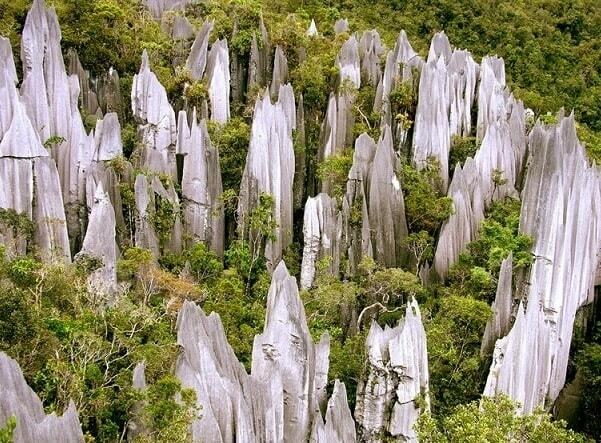 The Pinnacles at Mulu National Park are a collection of 45 metre high, limestone needles that cling to the side of Gunung Api (Fire Mountain). They form a forest of silver-grey stone encircled by thick green vegetation. 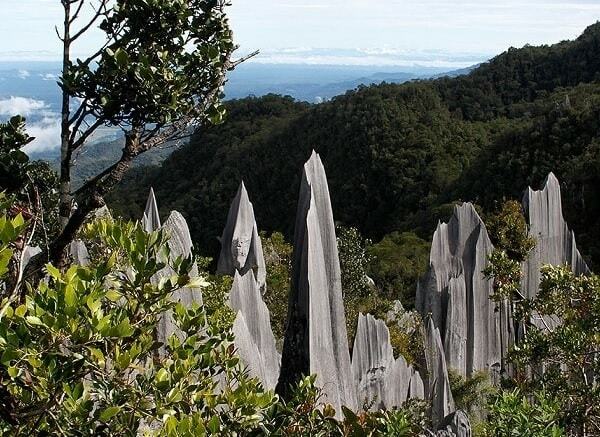 A trekking trail leads to a small viewpoint overlooking the Pinnacles and the �Pinnacles Summit Trek� is one of most popular treks in the park. The trek to view them is one of the most popular in the park. 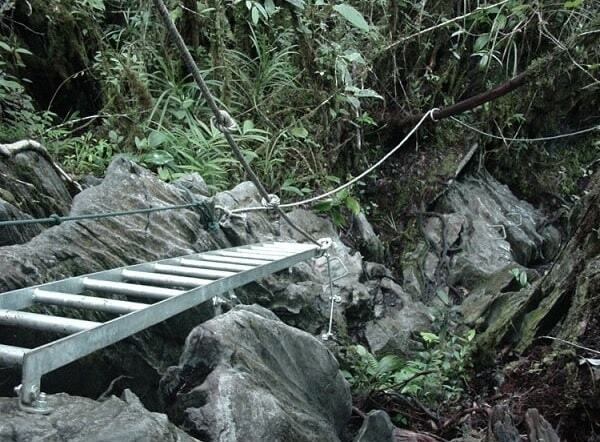 But be warned, the Pinnacle Summit Trek is a tough and challenging one. The trek requires a reasonable level of fitness as parts of the trail are very steep. It is usually done as 3 day/2 night trip although it is possible to opt for a 2 day/1 night trip if you are in good physical condition. The first part of the journey is a pleasant 1-2 hour boat ride along the Melinau River from the Park HQ to Kuala Berar. If the water level is low, the boat has to be pushed over rocky sections so the trip takes longer. It's followed by a 7.8 kilometre jungle trek to Camp 5. The real hiking begins the following morning. The climb is challenging, filled with fun and excitement. The trail is 2.4 km in length but rises some 1,200 metres. Vegetations vary following the changes of altitudes. The varieties of wild orchids and pitcher plants scarcely seen elsewhere can be spotted along the trek before reaching the Pinnacles. The last section of the trail is near vertical, with rope sections and 15 aluminium ladders strategically positioned to help with the climb. The vegetation is sparse although orchids, rhododendrons and pitcher plants thrive in the area, and can be seen at the side of the trail. The viewpoint area is made up of a number of pinnacles, rocks and vegetation and has excellent views of the silver-grey forest of stone that rises up from the surrounding vegetation. Fit and experienced trekkers should be able to reach the top in 2-3 hours. 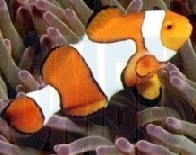 The not so fit but determined generally take around 4-5 hours. Most people spend an hour or so at the top, taking photos, resting and having a bite to eat before beginning the descent. The descent may take slightly longer than the climb.